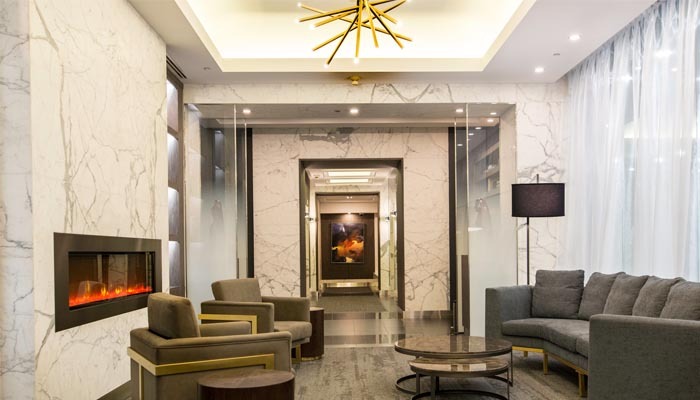 Toronto, ON, [May 14, 2018] – Minto Properties Inc. (“Minto Properties”) is unveiling its full scale renovation currently underway at 61 Yorkville Avenue in Toronto, Ontario. With an investment of $19MM, renovation plans come complete with spacious, open concept units and upgraded amenity space. Boasting thoughtful luxury and full-service concierge, the property provides short and long-term rentals in furnished and unfurnished suites, attractive to local and international residents alike. Located just off Bay Street, 61 Yorkville is home to 181 one and two bedroom lower and penthouse suites, as well as three bedroom penthouse suites. With a walking score of 99/100, the 17-storey building is surrounded by exclusive retailers, restaurants, services and heritage buildings in one of Toronto’s most coveted neighbourhoods. Fully renovated furnished and unfurnished suites are available in both the Yorkville Collection (one and two bedroom suites) and the Prince Arthur Collection (two and three bedroom penthouse suites) with 60% of units expected to be completed in 2018. Extensive amenity updates, including a new lobby, party room, media room and a renovated fitness center are completed. For more information, visit 61Yorkville.com or call 647-475-5932. Minto Properties, part of The Minto Group established in 1955, is a fully integrated real estate enterprise with expertise in asset management, property management, acquisitions and dispositions, development, financing and all related support functions. With our team of over 300 employees across Canada, we manage 13,000 multifamily units and 2.7 million square feet of commercial space in London, Ottawa, Toronto, Calgary and Edmonton. Our $2.9 billion portfolio is comprised of proprietary capital as well as private equity funds and managed accounts with institutional partners.